In the market for a new mortgage? We will be glad to assist you! Call us in Le Mars at 712-546-4175, in Sioux Center at 712-722-4545, or in Sioux City at 712-224-5400. Ready to begin? Apply Online Now. What's better than getting a bunch of new stuff to go in your future home? Nothing. But buying big ticket items before closing could be trouble. Keep in mind that until your keys are in hand, your lender is watching your finances very closely. We have given you a list of things below we suggest you avoid when waiting for closing. Don't buy luxury items. Although you may be dreaming of ways to turn your new home into a showplace, avoid big ticket purchases like appliances, electronics, or expensive furnishings. We also recommend that you avoid vacations and vehicle purchases until the closing of your loan. 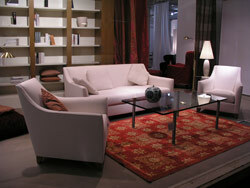 You may send up red flags with your lender if you finance your furniture on your credit cards during your loan process. It's also a red flag to make those big-ticket purchases with cash. Lending Institutions are looking at your available cash when considering your loan. Don't get a new job. Your recent job history should show stability. Getting a new career before you apply for a loan may not affect your approval at all. But in some cases, switching jobs during the mortgage application process could raise concern and affect your approval. Don't switch your accounts to a new bank or move around your money. Bank statements from the last few months for your accounts (savings, checking, money market, and other accounts) will be reviewed as the lender considers your loan application. To eliminate potential fraud, most loans need a thorough paper trail to document the source of all incoming funds. Switching banks or transferring money to another account - even if its just to consolidate funds - might make it difficult for your lender to document your funds. Don't give your FSBO (for sale by owner) seller earnest money, cash in hand. As a rule, your earnest money is yours, not the seller's until the deal closes. Although some individual sellers might not know this, the earnest money should be used for your closing expenses. We recommend that you put the deposit into a trust account, or get an attorney to hold it until closing. Should your home purchase fail, the purchase contract should specify where the good faith funds should go. At Primebank, we answer questions about this process every day. Call us in Le Mars at 712-546-4175, in Sioux Center at 712-722-4545, or in Sioux City at 712-224-5400.